This is another chettinad dish. A vegetarian offering too. Typically of Chettinad food, it’s spicy. I actually calmed this one down by adding considerably less spice than was asked. It’s still spicy, so god only knows how hot it would have been. 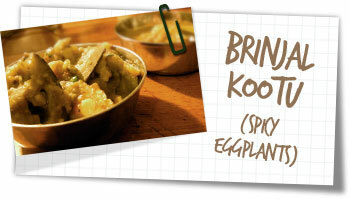 I served this with the delicious Chettinad Chicken, another delicious dish from the region. Cover the dal with plenty of water and cook for 25-30 minutes or until tender. Drain then roughly mash with a fork. Set aside. Heat a wok with the oil over a moderate heat. Fry the mustard seeds and cumin briefly till the mustard seeds start to pop. Add the garlic, green chillies, turmeric and curry leaves and fry for 2-3 minutes until golden. Add the eggplant and fry gently for 5 minutes, stirring frequently. Add the tomatoes and salt to your taste, along with 1/2 cup water. Simmer for 10-12 minutes until the eggplant is soft and the liquid almost gone. Stir in the mashed dal and simmer gently for a further 5 minutes to thicken. Remove from the heat and stir in the fresh coriander. Serve alongside another curry with rice or Indian breads.